For all their uses, spreadsheets have a number of inherent cost planning limitations. 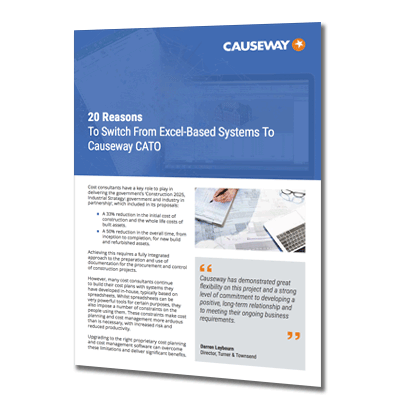 Offering a fully integrated end-to-end solution, CATO offers leading cost management functionality without the risk and inefficiency of spreadsheets. Minimise risk with built-in safeguards including automated formulae verification and spell-checking. Free up resources by elimating the need for time-consuming 'comp checking'. Work with multiple users on the same project with full and audited version control. Capture sub-totals and totals separately and ensure that sub-totals are not included in totals. Link to an up-to-date pricing service to ensure you are working with current cost information. Where spreadsheets impose constraints on cost consultants, CATO offers a comprehensive range of tools to minimise errors, maximise productivity, and drive out risk. For more information on the CATO cost management suite and how it can transform your profitability, get in touch. With multi-user collaboration support included as standard as well as access to industry-standard libraries such as RICS NRM1 and NRM2, CATO is designed to be a simple, intuitive, and familiar progression from Excel-based systems. Our webinar series is dedicated to showing just how seamless this transition is, and the wide range of practical benefits available to those who make the switch. Click here to register for our next webinar and see CATO in action. From feasibility estimating and cost planning through to life cycle costing, bill production, and BIM take off, CATO is designed to drive cost and inefficiency from critical cost planning processes. Since every business is different, each of our bundle packages provides a carefully selected range of features, ensuring you only pay for the features you need, and nothing more. Watch our short overview video to see what's included in our Essentials bundle.